Today is a very special day for us. After three months looking for stories in China and Philippines for our web page in Spanish, today is the premiere of the English web version thanks to all the donations we have received. 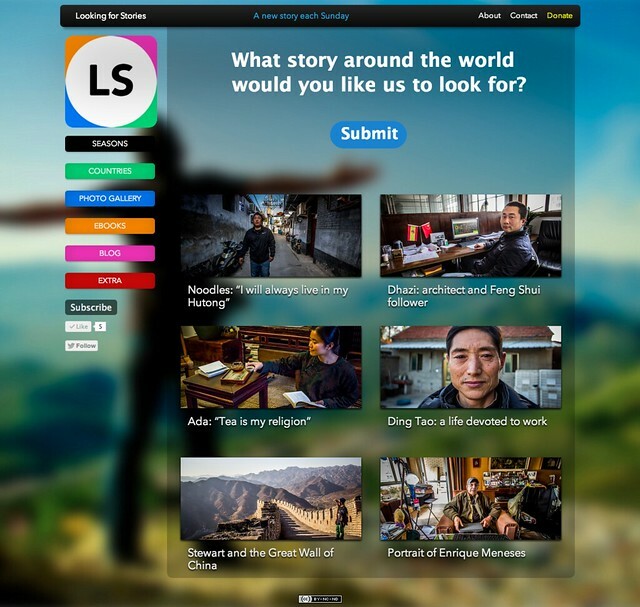 “Looking for Stories” is a documentary web produced by Joan Planas and Ana Salvá where you will find stories about people and places from all around the world that are published each Sunday. We want to tell you who are these people, how is their daily life, what they think about the world, religion, politics and life in general. To document each one of these stories we film the life of our protagonist during a whole day and even sometimes during a week to be able to record what defines this person and to become acquainted with our protagonist’s environment. On 25th February 2012 we began to look for stories in China and Philippines, two attractive, interesting and inexpensive countries, this last aspect was of great importance to us due to the fact that we are financing this project with the aid of people’s donations. Help us to keep looking for more interesting, curious and amusing stories. Send us suggestions about those stories you would love to know about. We will travel to look for them and we will narrate them using video, photography, articles and in this way set the path to a better understanding of the people inhabiting this small world. A wonderful initiative and also great filming. As a creative media person myself it’s something to look forward to.